Sundance 2004 got an early start this year as Lions Gate Films jumped the gun a bit in acquiring Saw even before the festival began. Like Open Water, the other wildly popular horror film at the festival, Saw proved to be an instant hit with prospective distributors. In the end, the film's production company, Evolution Management picked Lions Gate because of their recent track record. Low budget horror films such as House of 1000 Corpses and Cabin Fever fared well thanks to the nurturing of the rising distributor. Evolution spokesman Oren Koules also noted the handling of the upcoming High Tension as being key to their decision making. 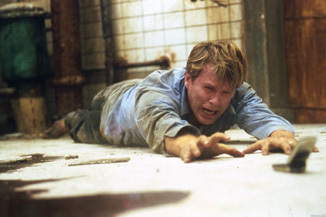 What is it about Saw that makes the movie so popular with potential suitors? The story. Saw plays upon the lurking fear that all of us try to keep pushed beneath the surface. It tells the stories of Dr. Lawrence Gordon and his newly-discovered companion, Adam. The latter gentleman has recently survived a near-death experience at the bottom a filthy bathtub. When Adam wakes up, he quickly realizes that his situation is not greatly improved. Comfortably resting between Adam and the doctor is a blood-soaked corpse. Judging from the gun in the hand and the bullet hole in the brain, the former human has apparently committed suicide. The two survivors would like to do their best CSI and investigate further. Alas, both of them are frightened to discover they are chained to a wall. You might be inclined to believe their predicament could not possibly grow more perilous. You would be wrong in that assumption. Lawrence and Adam find out that their capturer is the illustrious Jigsaw, a homicidal maniac so designated because of the way he marks his territory so to speak. The slayer has gained this moniker because of the way he brands his victims in the pattern of a jigsaw puzzle piece. It's the killer's way of taunting the cops while taking credit for the crime. Summarizing, Adam and Doc Gordon awaken to find themselves chained to a wall. A corpse is the third member of the group. The captor is a serial killer who relishes taunting the police with the details of his many crimes. I know two fellows who are going to need a lot of therapy if they manage to survive all this. Saw is something of a combination of Cube and The Bourne Identity. The prisoners awaken to a terrifying predicament but are armed with no memory of how they got to be here. If the duo is unable to work together quickly and effectively, that's the ballgame.